IN an attempt to avoid blinding the first year Multimedia journalism students, one lecturer supplied paper plates and drawing pins for the eclipse on March 20. 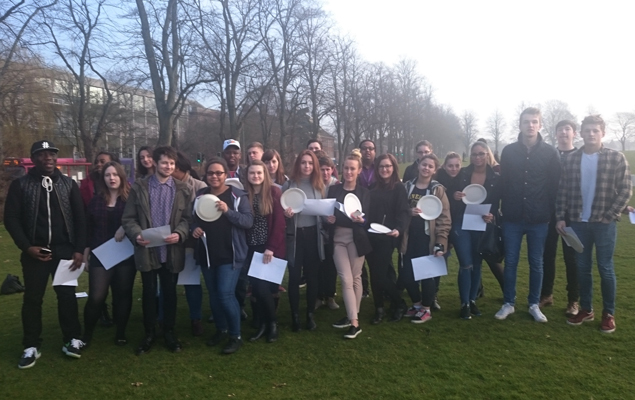 The students had been due to hear a lecture on digital magazine design, but instead were ushered out onto the nearby Racecourse park armed with their makeshift solar eclipse viewers made by piercing a hole on the plate and reflecting the image. This was to avoid looking directly at the sun, which can cause serious eye damage. The event, which last happened over a decade ago in the UK, was rather hampered by cloud cover, although some students did manage to capture the rare event on their mobile phones – without looking directly at the sun, of course.